Looks like Horwath is going for the Christian vote with her strong stance on keeping alcohol out of corner stores. However the poll does show the Liberals are playing defence as Wynne is spending 79% of her time in Liberal ridings when they won 54% of seats in the 2014 election. The PCs are also on defence but to a much lesser extent as Ford is now spending 33% of the time in their own ridings, which were 26% of all ridings in the 2014 election. On the other hand, the NDP leader is the only leader spending less time in the 19% of ridings they won in 2014, as Horwath is spending only 13% of her time in NDP ridings. It also shows that Horwath is focusing more on winning Liberal ridings, spending 70% of her time which is 16% more than the 54% of ridings held by the Liberals in 2014, although she is also spending 33% of her time Conservative ridings, which is 7% more than the 26% of ridings that the Conservative ridings. If I were a Liberal, I think I would have the good sense to keep my mouth shut about finances. The Kathleen Wynne government is low-balling its budget deficits by billions of dollars, according to a report released Wednesday by the province's auditor general, just six weeks ahead of the provincial election. The Liberal government's projected deficit of $6.7 billion for 2018-19 should actually be $11.7 billion, says Auditor General Bonnie Lysyk in her pre-election report on government finances. Lysyk said the government failed to account properly for the financial impact of its Fair Hydro Plan on provincial coffers and improperly treated the revenues and expenses related to two provincial pension plans. $6.6 billion deficit in 2019-20 should be $12.2 billion. $6.5 billion deficit in 2020-21 should be $12.5 billion. "The consequences of these major differences between the governments projections and the likely actual deficits are significant," Lysyk said. "They create the perception that the government has more money available to it than it actually does." Jagmeet Singh opening for Andrea today? 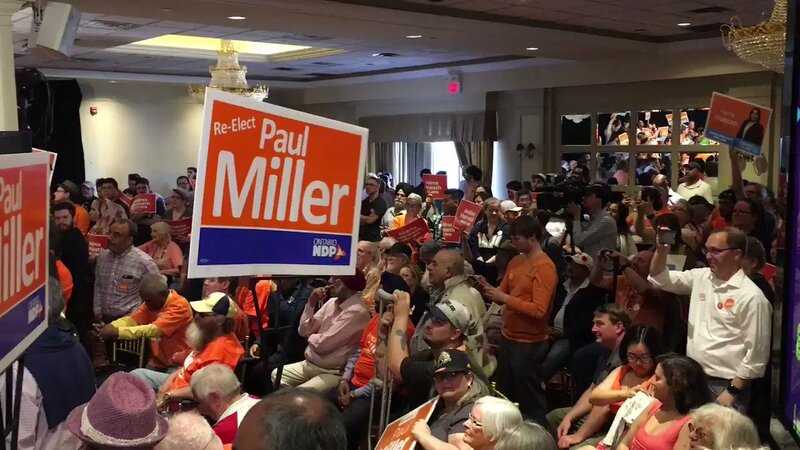 Is this the largest crowd of the campaign for the NDP? Wow, BIG rally. NDP organizers say there are 1,000 people at Horwath’s rally in Peel Region. Wow! 1K people at a rally in Brampton? Brampton is a traditional PC stronghold (but not in recent years I'm thinking). If this is really true, then Doug Ford is in serious serious trouble!!!! I believe Ford needs a strong showing in Brampton, for numeric and traditional reasons. If several seats swing to the ONDP in Brampton, then the ONDP and socialist issues can never be belittled in Ontario ever again! Actually Caledon/Orangeville is probably the strongest PC fort, but a strong showing in Brampton will pull in stronger ONDP number for C/O! For me, this is huge news for the ONDP!!! If ONDP can make a strong second place numbers in Caledon Orangeville, it would be a strong possibility that the federal NDP can form government in 2019! Remember when you were a child and good things were free? I think you are still underestimating the reality that the Liberals have a majority and so the seats they need to win are in their hands whereas many seats the Conservatives need are in Liberal hands and almost all the seats the NDP needs are in other hands. In other words if the parties spent even time campaigning across all seats the chart would not look much different than this. Good to see that the issue of poverty in Ontario is being addressed, at least to a greater extent than is typical in our elections. As Liberal Leader Kathleen Wynne, Green party Leader Mike Schreiner and representatives from the Progressive Conservatives and NDP watched from the front row, Lawless and other anti-poverty activists called on all parties to make Ontario a fair and equitable place where everyone belongs. Anti-poverty activists have spent the past 15 years pushing the Liberal government to rebuild Ontario’s social safety net after an era of punishing cuts under the previous PC government of Mike Harris. They dread a return to the austerity of the 1990s, when the Harris Tories slashed welfare rates by 22.6 per cent, cancelled the construction of 50,000 affordable housing units and froze the minimum wage at $6.85 an hour for eight years. Andrea Horwath’s New Democrats are building on that idea by proposing affordable dental carefor all Ontarians in a sweeping $1.2-billion program for about 4.5 million adults and seniors who are without workplace or pension coverage. It would be free for individuals with incomes under $30,000. Hang onto your hats folks as here come the attacks on the NDP. Big advantage for the NDP however is Andrea’s popularity. And the question remains...have Unifor moved away from their early position, which was an effective endorsement of the Liberals? Kathleen Wynne has completely given up, as it seems she is sleepwalking through this campaign. I just don't see the fire and the fight in her. I noticed that even in the first week of the campaign. Because of that the media is completely ignoring her and her campaign as there are only two media narratives reaching the electorate. 1) Ford scandals 2) NDP momentum and their rise in the polls. Even Doug Ford is joining that narrative as his presser today, he spent all his time attacking Andrea Horwath and didn't even mention Kathleen Wynne name once. And she is the incumbent Premier! If Kathleen Wynne was just going to give up like this, she should have just....well I did previously mention it, but let's not go there. But she has just given up, and everyone on the campaign trail can see it. Even the media as they have pretty much stopped covering her and her campaign. And they are the sitting Government! Many of Ontario PC leader Doug Ford's key policies don't add up. Every party has a few nutters - the key is to not have too many of them, eh! Andrea has been really boogieing around the province in the last week to a greater extent than the other leaders, indicating the NDP is seeing opportunities in all regions of the province. Anyone know if there is going to be a French language debate on TFO, like there was the last time? And the Liberals will be supporting who in a minority government? Reasonable question and voters would like to know. Why would any party answer that question in the middle of a campaign. That would be admitting defeat, might as well pull all the candidates as someone suggested upthread. All the parties will claim that they will form the next government, and so should they while they are campaigning. From commenting on Kathleen Wynne’s smile to insulting female reporters, Ford’s sexist rhetoric is revealing. 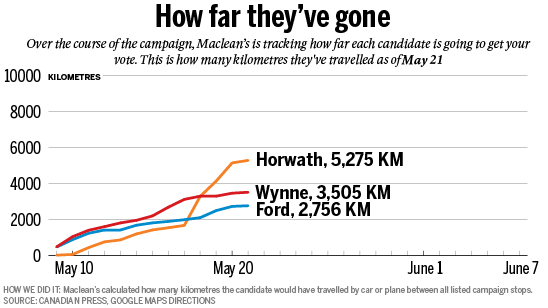 How is the @OntarioNDP's apparent surge in the polls playing out on the campaign trail? "You can really feel it out there on the road," says @CBCQueensPark. ... And then she says this. This video @macleans provides a great break down on why @fordnation numbers on benefits to #minimumwage earners, long-term care beds & cap and trade just don't add up. Let's just say more trouble for the PCs. Sounds like a stalling tactic. This is significant. Many have suggested the PC pledge to take over the TTC subway is aimed at turning it into a P3.